The HDMI Forum has issued the final version of the HDMI 2.1 specification, the latest iteration of the video communications standard, with version 2.1 and its new Ultra High Speed HDMI Cable specifications enabling video resolutions of up to 10K via its increased bandwidth capacity of up to 48 gigabit per second. Previewed during CES in January of this year, the latest release from the HDMI Forum was developed by the forum's Technical Working Group, with the finalized version available to device manufacturers to incorporate into future products. Companies involved in the HDMI Forum and its Technical Working Group are highly likely to be among the first to adopt the new specification, with the membership including Microsoft, AMD, Intel, and Nvidia alongside other device and component vendors. The headline feature of HDMI 2.1 is its support for higher video resolutions and faster refresh rates, including 8K at 60Hz, 4K video at 120Hz, and up to 10K-resolution video meant for "commercial AV, industrial, and speciality usages," the Forum suggests. It is also claimed the standard is capable of handling uncompressed 8K high dynamic range (HDR) footage, video that requires high amounts of bandwidth. Dynamic HDR is also included in the standard, for the transmission of video with ideal values for depth, detail, brightness, contrast, and wider color gamuts. This can be performed on a scene-by-scene basis, though it is also possible to use it on a frame-by-frame basis, depending on the content. Enabling the changes is the Ultra High Speed HDMI Cable specification, which is designed with "exceptionally low" electro-magnetic interference in mind, minimizing interference from nearby wireless devices while still offering up to 48 gigabit per second of bandwidth. The cable design also allows it to be backwards compatible with earlier HDMI standards, so devices and televisions using older HDMI versions can still be connected together without any interoperability issues. The 48 gigabit per second bandwidth in HDMI 2.1 is more than double the 18 gigabit per second bandwidth available in the HDMI 2.0 standard. HDMI 1.4 offered 10.2 gigabits per second of bandwidth, while HDMI 1.0 provided just 3.96 gigabits per second. Enhanced refresh rate features are set to improve the smoothness of motion and transitions in video, especially for gaming and movies, with Quick Media Switching (QMS) eliminating any delays that can cause a blank screen to appear before content is shown. For gaming and VR applications, Variable Refresh Rate (VRR) reduces lag, stuttering, and frame tearing, while Quick Frame Transport (QFT) also aims to minimizing latency. An Auto Low Latency Mode (ALLM) will allow for the ideal latency setting to be set automatically, depending on the type of content being viewed. For sound, support for eARC for object-based audio is included, which the HDMI Forum claims will support the "most advanced audio formats and highest audio quality." Including eARC is also said to ensure full compatibility between products using HDMI 2.1 and other audio devices. 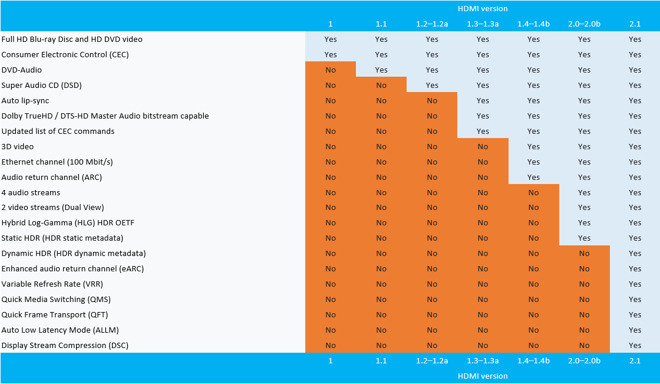 While the final version of the HDMI 2.1 specification has been provided to vendors, the Compliance Test Specification will be arriving at a later date. The HDMI Forum expects to publish the test specification in stages during the first three quarters of 2018, suggesting the specification may still be at least a year away from being used in commercial products. Though Apple itself is not listed as a member of the HDMI Forum, the company does extensively support HDMI in various forms, and pushes to adopt new standards where possible. Aside from devices with dedicated HDMI ports, there are embedded HDMI implementations in Lightning, USB 3.0, USB 3.1 Type-C, and Thunderbolt 3, enabled by adaptors.